CMC Sundays on January 6 is going to be one to remember. The day will be full of musical experiences for everyone. There will be three classes for very young children (ages 6 months to 5 years), two opportunities to participate in Field Day mass music ensembles, the Vocal Practicum, Ukulele Jam, and Blues Jam. That list doesn’t include other CMC Sunday favorites like private lesson demos or the Instrument Petting Zoo, which will also be happening. CMC has teamed up for the first time with a music education video game developer to create a music-making experience to inspire guitar and bass players at the January CMC Sundays. Games developers from Rocksmith Remastered will be on hand to demo their game which complements private lesson and group playing instruction, using responsive technology to teach riffs, songs, and ensemble playing. 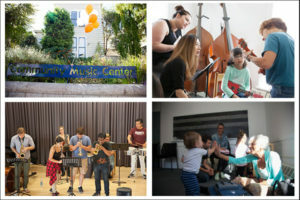 Players are invited to try out new techniques with a CMC teacher in a lesson demo or drop into the Blues Jam to hone group playing, making for a well-rounded and inspiring music session.